Finding adventure pals is not always easy, at least not in a town of less than two thousand people. Consider that out of a given population, maybe 50% day hike, but of those, even fewer day hike more than a couple of miles. Then carve that up some more to determine the backpackers. And snowshoers. And cross country skiers. In a bigger mountain town, this might not be a problem. But just like the men who come here optimistically single, then either import or leave, there is a very small pool for finding soulmates. Every adventure I've taken my friend R on has nearly resulted in disaster. There was the blizzard we faced as we marched to the ski hut, and to top it off, our work up there included tarping an outhouse. Few would maintain cheerful spirits in the face of those obstacles. Another trip nearly resulted in horror when one of her dogs decided to slide down a waterfall. And let's not forget the drive along an exposed single lane dirt 4WD track, with expansive views of the canyon we would catapult into if one wheel left the road. Add in some cowboys with a horse trailer coming in the other way, and I can see why she would never want to go with me again. Luckily she is resilient and agreed to come snowshoeing with me. 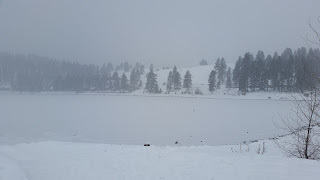 Instead of being daunted by the conditions, she enthused about what a great workout it was as we slogged uphill from the ski area. This is extreme snowshoeing at its finest, at least for this area. No easy flat trails here! In fact, we were making our own trail, ending up at a tiny frozen lake. Not all adventure pals have been so happy. On occasion I have looked back to see an expression of suffering cross the faces of my companions. This has made me wary of inviting people along. While I like a casual stroll as much as the next person, I tend to want to get to my destination, even if we have to inch along icy logs across a stream or plow through deep snow. I find that women aren't very good at saying when they want to turn around, or if they want the pace to be slower, or even if they want the pace to be faster. I also can feel responsible for conditions--if I drag someone into a mosquito-infested hell and I didn't know about it in advance, I feel bad. Ridiculous, I know. We are all responsible for adjusting our own attitudes. I try a mixture of both, friends and solo, because sometimes it is easier to only worry about yourself. I can stop when I want, or I can keep going without stopping. I can turn around if I don't like the situation ahead. If mosquitoes make me run screaming, there's nobody to see the tantrum. But at the same time, it's nice to have friends to laugh through some situations. My friend and I still laugh at the muddy conditions we slogged through in 1991 on the Florida Trail. Our friend Chris is long gone, the victim of an aggressive brain tumor, but he had coined the phrase, "Mud sux!" and we still say it to each other. It's also nice to bounce things off of other people: is this really the trail? Where do you think it goes? This picture of Ruby digging a huge hole has nothing to do with this post. But she's adorable, so there you go. Even though each outing isn't always perfect, resulting in views and bug-free environs, I'll keep taking friends to see the country. It's almost always worth it. So far, they keep coming back, so I must be doing something right. I crashed through the crunchy Florida woods, looking for Hidden Pond. A freaked-out backpacker, fleeing the Florida Trail after a night encounter with two growling bears near his tent, had told me that it was a clear pool of fresh water. I had passed something that looked like that, but it was called "Hidden" Pond, so maybe it was back here, by a cluster of campsites. There was, indeed, a pond, and a man who had been hidden by the palmetto. "The pond's right there," he said, waving a hand. Feeling foolish, I retreated to the original pond. This had to be it. This is Hidden Pond. But it's not hidden. I don't get it. It was a great spot for a lunch break after a morning of hiking the Florida Trail. This little known National Scenic Trail (it has this designation only on the federal segments) stretches 1000 miles south to north through the state. Almost anyone who tries to thru hike it gives up because while there are miles of tread, there are also supremely long road walks (think hundreds of miles). In the past, I hiked a small section in the southern end, which was a slog through mud and water. Not all that fun. But here, in the Ocala National Forest, 66 gorgeous miles are available. You have to adjust your thinking here. There are no majestic views. The scenery is subtle, and only inches of elevation dramatically change the vegetation. There's desert scrub, with a sandy trail; hardwood trees; prairies, and palmetto forests. It would be easy to be bored with the flat terrain, but in the eighteen miles I hiked, I was only fascinated. The "chilly" winter temperatures---dipping to 20 at night, 60s during the day--meant that few people were around. I saw a handful of backpackers making their way to Hidden Pond, and none at all the next day when I hiked from Farles Prairie. All the same, this trail has a different feel. Perhaps it is the proximity to Orlando (about 50 miles) or the easy access to the Juniper Prairie Wilderness, but it's a place I felt that I had to look over my shoulder a little. I wasn't convinced I would do a long solo backpack trip here. In fact, I was glad I didn't know about this story as I munched a delicious hummus sandwich at Hidden Pond. I had come here early on a work trip, and had found a remote cabin on a sand road to stay in. Sand roads are interesting phenomenons, not to be trifled with, presenting a clear and present danger of being stuck for days on. The cabin bordered a lake, and was an inholding in the forest. It was quiet and peaceful, and I slept better than I have in years (11 hours one night). My time in Florida seems like a dream. I was only there for three days, hustled back across the country unceremoniously due to being furloughed in the government shutdown (I was supposed to stay for another week). Did I dream being on the trail? In the end, aren't all good trips like this, almost too good to be true? Grasshopper Lake, in front of the cabin I stayed in. Last year at this time, we were skiing across this lake. Sadly, we are in a somewhat different situation this year. I count on winter as a time to do less running and hiking and, instead, more skiing and snowshoeing. They are different activities that work different muscles, something you have to think about as you pile on decades of athletic endeavors. Unfortunately, there's no such break this year. The trails aren't snowy, but they are rivers of ice. Not just "I can wear microspikes and be OK" ice, but thick, slippery, "I might fall and break something" ice. Desperate to avoid the treadmill, I have been trying to run creatively. Endless loops around the campground, with the state park workers looking on in bemusement, crunching through snow on the moraine....none of it is fast. I'm glad I don't care about my time anymore. I'm just glad I can still run. Another day I decided to "chase the fat bike." It's a good incentive to keep going up the hills, because sometimes I can keep up and even pass the bike. Sometimes I can't. The bike can smoke me on the downhills, but sometimes on the flats I stand a chance. It all comes down to footing. On this occasion, the snowmobile club had groomed the canal road, and the conditions were outstanding. There was just the crunch of my shoes on the corduroy as I climbed the hills. There were also occasional stops as I ran into a friend skate skiing and several friends snowshoeing. Those caused delays in my quest, but I usually managed to catch up. It was one of those times when I remembered why I like to run--the stars aligned for a pain free, lighter than air run. Eventually I turned around and went down to the ski area to do a shuttle for the fat bike. With the sun beating on the deck, it felt like summer. Which is both scary and wrong, but in the moment, I appreciated it greatly. I believe this one of the first descents of the ski area on fat bike. People keep saying the snow will come, but they also say that there is greenup in the canyon. It is way too warm for January. This could mean a smoky summer for us. In seasons past, February and March have been the snowiest months of all. We will wait for snow. In the meantime, I'll incorporate chasing a fat bike as part of my training regimen. I read the email from the Park Service with interest. What?! Since we had less hikers than I had paid for, I now have a Grand Canyon hiker credit, that must be used by December 26, 2018. Yippee! Immediately I started thinking. 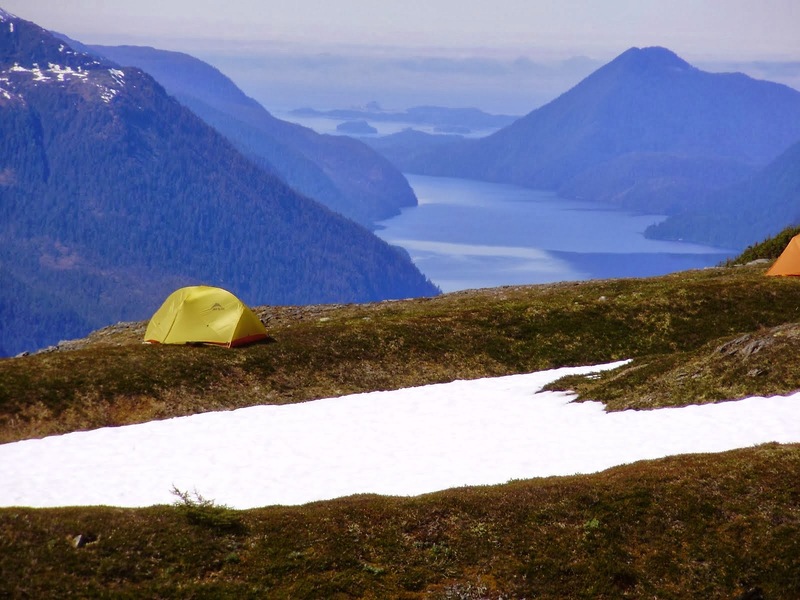 For GC backcountry permits, you can start applying four months in advance of your hike. Woe be to the fool who waits a longer time than that. The permits go fast. They are now working on May. Since nobody with an ounce of sanity really should be hiking in the inner canyon, especially the Tonto, in the summer months, that leaves October, November and December. Hmm, I thought. Clear Creek? The Gems? Then: whoa there, partner! You just got back from a trip! What's the matter with you? Then I realized...it's Adventure Mania. This happens when I get back from one trip and am not quite ready to give in to the inevitable of real life. I want to always be on vacation! The only way to prevent adventure mania when you really can't give in to it is to do smaller, local trips. They aren't as fulfilling, because at the end of the day you come home to chores and work. But it's better than nothing. I have never been one to not go on a trip, even if it's expensive, even if it means time off work, even if. Who knows how much longer we all have on this revolving sphere? You need to do what "melts your butter," as my former fire management officer would say (another saying is "whatever blows up your skirt"). For me, there are many reasons to stay home, but I know that won't make me a very happy person. With that in mind, we ventured down to the Imnaha for a day hike. The hike is one I have done many times but it never fails to impress. The two rivers--the Snake and the Imnaha--flow together as they have done for centuries. It is a magical place. The sweet 12 year old. He has recovered from his cancer surgery well! Even the drive down to the trailhead, as slow and awful as it is (it takes an hour to drive 11 miles) was worth it. Passing over a new landslide in this dynamic environment, we easily trekked the four mostly level miles to the confluence. We should have brought a tent, we agreed, since the temperature was in the forties--sort of unheard of this time of year. Reluctantly we had to head back immediately, since the forecast called for rain. On these clay roads, if it rains, you can be stuck for days until it dries out. Since we didn't have any snacks, that didn't seem like a good idea. The snow was a miserable crust. Skiing was out of the question. I struggled with snowshoes, sinking in with each step; not sinking in to powder, but through a crunchy crust that required a slow motion pace. After an hour and a half, I gave up. Adventure isn't always fun. I'm never sorry I went outside though. It "melts my butter". I followed three men into the Grand Canyon. "When did I get to be old?" Camel asked, echoing my thoughts. "I bet you ran down this years ago," he added. He would have been right. Now I pick my way through the rolling pebbles and lean on my trekking poles as I descend the drops between the rocks. Still, I am doing this. I am back in the Canyon for the tenth time, and, unlike me, the experience never gets old. Our itinerary isn't too ambitious: 42 miles in four nights, but as always, the canyon miles come harder than others. The trek from the Tonto trail junction down to Hermit Rapids is far rougher than I remember, and the beach itself has been invaded by willow, a far different story than when I was here last. We stumble into camp in time to see some Canadians take on the rapids. They have 18 days on the river, and as we settle into our camps, falling asleep to the roar of the water, it's hard not to wish we had longer, too. We have hit a mysterious warm spell in the canyon, with no ice or snow to navigate at the trailhead, and although the evenings drop into the thirties, the daytime temperatures soar enough to allow for a hiking skirt..in December. We hike back up the Hermit canyon to the Tonto trail, taking it across and back down to our next camp at Granite Rapids. There are few people on this section of trail, and we have the river mostly to ourselves. A shooting star blazes across a full-moon sky. How lucky we are, I think. My trail companions are as mesmerized as I am. Blue Dot speaks of growing up in India, where people walk for a purpose. Just going for a hike like this is mostly unheard of. Even Camel and Good Stuff, who have been here before, recline in their folding chairs ("only a pound," they defend their choice of burden) and take in the interplay of water, rock and sand. On the third day, we slog back up the gravelly wash to the Tonto and ten miles east to Horn Creek. Only one party per night is allowed to camp there, and the silence is absolute. A small creek, said to be radioactive from a long-abandoned mine near the rim, trickles below our tents. Tempting fate, we drink from it anyway. This is not what we will die from, we tell ourselves. As we reach Indian Garden campground on Day 4, the solitude and peacefulness is broken. Ninety people share the Bright Angel campground with us. Disregarding the warnings not to hike to the river and back in one day, hordes of day hikers, some in designer jeans, take it on. At first, I am tempted to veer off onto the East Tonto instead, but then I decide to embrace the experience. This is "glamping" at its finest: flush toilets and wine at the Phantom Ranch cantina. I lie on Boat Beach until the sun fades; it is nearly seventy degrees. On the last day of the year we pack up and head out. Good Stuff has claimed that I will bolt for the rim, because I always do; I have said I won't, but in the end I can't resist. I come upon a man in jeans, who starts running when he sees me, reluctant to let me pass. Game on, buddy! I think, and he is forced to concede (sorry, you can hike faster than me and I will let you go, but running so a woman doesn't pass you isn't cool). I climb nine miles and five thousand feet in four hours; I want to know if I still can. Like all good trail companions, we have allowed each other the freedom on this hike to go solo for a few hours if we choose. I savor this. People who get it are hard to find. I have thought that this, my tenth time in the canyon, might be enough. I am tired of the Corridor crowds, and I have beaten a path between Hermit and Indian Garden several times. What remains are the harder, more remote trails: Tanner, New Hance, South Bass. I am not great on the slippery downhill, and am not sure if I want to attempt these. But as I arrive on the rim, I know that I am probably not done with the canyon. Not yet.